Good morrow lemmings and welcome to another splendiferous edition of Questionable Time, live from Doncaster! This, incidentally, is where Ye Greate Laboure Leadere Ed Miliband keeps his counsel and apparently was in danger of getting the boot but now isn’t, according to some Ashcroft dude you may have heard of. Whatever, I’m sure nobody actually cares. My goodness this was a boring episode, though, so I’ll just expand this little opening paragraph for as long as possible. Hm hm hm. Lalalala. Okay, that’s enough. We really should get started. Don’t worry, my friends – it won’t be like this next week [imagine foreboding music playing here]. Sajid Javid starts us off, with his weirdly disproportionate head, talking about ~*~the challenges~*~ of dealing with the deficit and how that happens to involve cuts, and you’re all just gonna have to get used to it, sry2say. I hope you like the 1930s ‘sack dress’ aesthetic! By the way, I can’t read his lapel pin. It looks like a pretty blue flower. Anyone with any insider info on what the heck it is, give me the deets. Why don’t we ask the people where the cuts should or should not come from, says Omid Djalili. After all, we don’t trust folks who moo like they do in that there House. Having watched a great many PMQs in my time like a saddo, I can confirm that they do indeed moo a great deal. Just pad the benches with hay and they’ll be happy. Wait, do cows even eat hay? Meanwhile, representing the red team, Yvette ‘pixie woman’ Cooper is up to bat. It’s strange, for the last few weeks we’ve had the most likely future Labour leadership candidates in quick succession: Burnham, Umunna and now Cooper. Feel free to debate amongst yourselves what their respective QT showings say about their chances, but for now let’s all concentrate on Yvette bellowing about the great unfairness of it all. So unfair! These cuts are just so unfair, mum, she cries, practically stamping her heel but in a much more boring way. We’ll balance the books…but…fairly. Sajid demands to know exactly how, but his interruption is interrupted by the arrival of Jill Kirby on the scene. Looking like Theresa May’s older, even scarier sister, she makes a worryingly long diet-related metaphor and finishes it off with an order to ‘please clap’, which for a moment I thought was a frightening threat to the terrified audience. I can see how she was formerly head of a think tank set up by Maggie T.
Shirl the Pearl, one of the QT old guard (I am thankful, at least, that there is a QT old guard still remaining, who can remember the glory days of Robin Day and whoever it was that came after him) umms and ahhs, and the general public are not satisfied by her or indeed any of this nonsense. Tell us exactly what’s going to happen, they cry in unison. Yvette rattles off some Labour policies and the panel scoffs at her, or at least Sajid and Jill do, and presumably high-five under the table afterwards. Jill wants us to be exactly like the blessed USA. ‘They have a much more balanced economy’, she gushes, conveniently forgetting that they also have barely any truly public services and certainly no proper health service. But maybe that’s the best way forward, eh? It seems that direct democracy is the way2go, even if it would probably end up in a huge screaming mess. Everyone wants referendums! You get a referendum! I get a referendum! We all get referendums!! The next question is on the British Identity: what is it? We just don’t know. Isn’t it all about being a jolly nice chap? asks Yvette innocently. 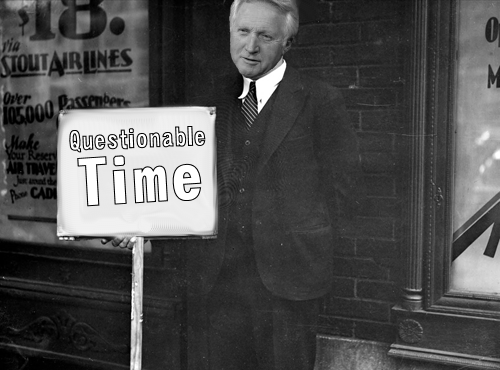 Dimbleby is also somewhat confused. He corners the man who asks the original question – about the name ‘Mohammad’ and how it is scary – in his own, Dimble-ish way that makes you pee yourself but very quietly. However, it is the audience who really answer this question, by taking part in many people’s favourite pastime of all: dissing the Daily Mail. Now that’s what I call British Identity! Now here’s a question about (guess who?) nail-chewer supreme, Grumbly Gords. Jill Kirby blames Gordy for everything except keeping us out of the Euro. Thanks Obama Gordon. But – wait, what’s this? It’s Shirley Williams, riding to the rescue! She passionately defends the departing ex-PM which takes everyone a little aback for a moment. However, the Eggman/Sajid has the master plan, and he fights back, claiming that while Gordon was a smart dude ‘n’ all he was also a complete dingus. Yvette disagrees, obviously (although doesn’t praise Gordo to the high heavens or anything either – Labour know he’s a liability, deserved or not. Isn’t it sad, Gordon?). Then everyone gets into an argument about zero-hours contracts. We’re abolishing them! No, we are! No, we are!! A zero-hours contract is better than no contract at all, says Jill, to general uproar, and a man in the audience yells ‘go back to London!’. So say we all. Our final question of finalness is finally about obese people and whether we should care about them and their lives. Jill is not in favour (surprise surprise) and wants people to help/heft themselves. The rest of the panel shake their heads with varying degrees of ferocity. Omid, who so far this programme has been the only source of non-boredom by actually cracking a few jokes (which I hear is something he does for a job, imagine that) is grotesquely offended! I am also offended. My roast potato addiction isn’t going to go away on its own, you know. It’s terminal. And slathered in gravy. Well folks, it’s Nigel Farage and Russell Brand next time round – ‘if we survive that’ according to Dimbledore. The two greatest minds of our generation. Merry Christmas one and all. And, by the way, another plug: I’ve created an Ed Miliband Adventure Game in my spare time. It’s exactly what it sounds like: a comedic text-based adventure game starring Ed Miliband. Because that’s just the kind of thing I like to do. Go play it if you’re interested – which if you’re reading this blog, you should be.